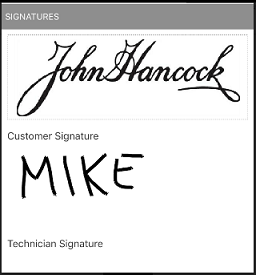 The customer and tech can sign the Work Order on the mobile device. Tap Signatures. 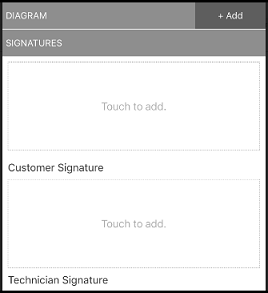 Tap Touch to Add above Customer Signature. Hand the device over to the customer with the instruction to use a finger to sign the Work Order. 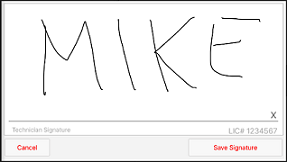 Tap Save Signature. Tap Touch to Add above Technician Signature. Use your finger to sign your name. 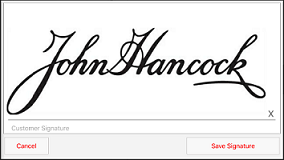 Tap Save Signature. Both of your signatures are in the Work Order. They will appear in the emailed and printed Work Order. When you’re ready to end the work, tap the red End button in the upper right to set the time you finish. To change the time tap it again and make the correction. 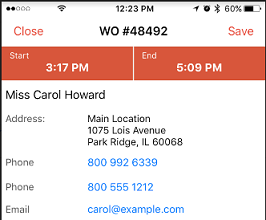 You are presented with five options when saving a Work Order on the mobile app, each has a different function. Tap Complete & Exit. Depending on the settings for the customer, they will receive an Invoice, Work Order, or a combined Invoice/Service Report. From the Calendar, tap the menu in the upper left, tap Settings. To enable printing, tap the slider next to Print. 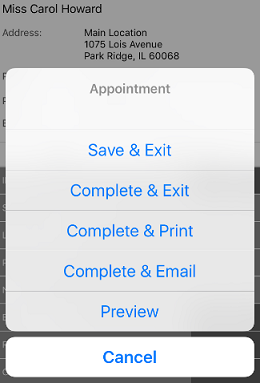 To use AirPrint (iOS), tap the slider next to AirPrint..
Congratulations, you’re done with your first mobile app Work Order! Do this a few more times and you’ll get down to completing a Work Order in less than 10 minutes. Also watch this video that wraps everything up for completing a Work Order.